Children fell for the band's industrial-techno, Gothic style with their spiky masks, chains and platform boots. Their young fans have also taken to chanting the dark lyrics. Hatari don't just preach anti-capitalism. They claim their entry in the competition is a political statement against Israel's government, even though the song has no reference to Israel. The contest is being held in Tel Aviv because Israel's Netta Barzilai won it last year. When I meet Hatari, they are warm, polite and well-spoken - and, in contrast to their stage look, wearing blue shell-suits emblazoned with the logo of a fictitious soft-drink company called SodaDream. Equally bizarrely, the band are openly challenging Prime Minister Benjamin Netanyahu to an Icelandic wrestling match in the centre of Tel Aviv. They are bitterly critical of Israel's policies towards the Palestinians and say it is absurd to allow the country to take part in the contest. Some Icelanders believe Iceland's public broadcaster should have boycotted the event. "The criticism is understandable and we are glad to see a serious discussion about the politics of the competition take place," Matthias says. Hatari's members should know a thing or two about diplomacy. Einar Hrafn Stefansson, the drummer in the spiky leather mask is the son of Iceland's ambassador in London who was part of the negotiating committee when Iceland applied for European Union membership. 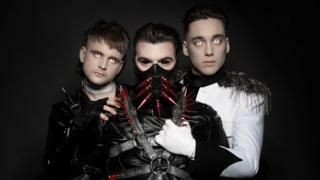 No lyrics, speeches, gestures of a political, commercial or similar nature shall be permitted during the Eurovision Song Contest"
Hatari say they have no plans to carry out a stunt like bring a Palestinian flag on stage. "We doubt it. Because it's forbidden." "Silence can be a political statement. And it's clear all of the songs that will be performed on stage in Tel Aviv will offend the sensibilities of many people," says Klemens Hannigan. So how far can they get in a non-political contest? "Our aim is to perform in Tel Aviv and win the Eurovision Song Contest," said Klemens Hannigan. As for their challenge to Israel's prime minister for a wrestling bout in Tel Aviv, their offer remains unanswered. "We understand Netanyahu is a busy man, so we are patient," Mr Hannigan said.